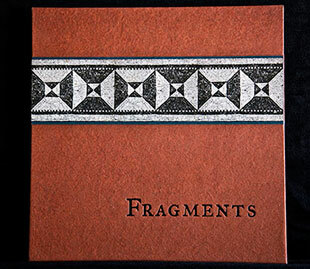 Artist statement: "Gail Skoff is a native Californian who has been photographing since her teens. Her early work included images from Bali, the American Southwest and Hawaii. These were black and white photographs which were hand-colored with oil paints. This mix of photography and painting was a technique she used for almost 30 years." Berkeley, California: Gail Skoff, 2016. Edition of 3. 13" x 13" handmade accordion book containing 24 color photo montages including a tipped in map, 4 full-page spreads, and two cutout images. Archival pigment photographs printed on Canson Rives rag cotton paper. Calligraphy and map by Georgianna Greenwood. Enclosed in a box with a gold stamped spine and 2 inset canvases. Bookbinding by Andy Rattner. Cover and box painting by Dominique Perotin. Signed and numbered by Gail Skoff. 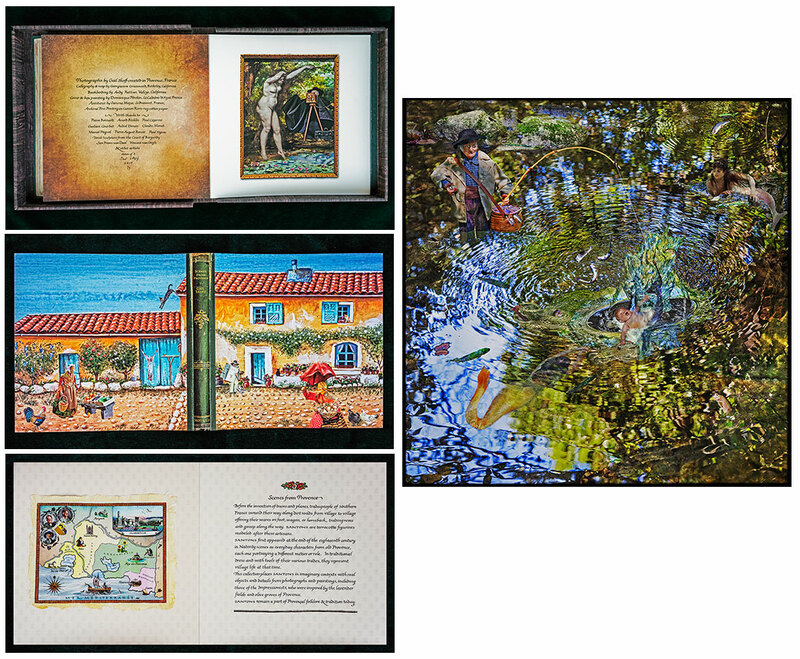 Gail Skoff: "Mixing reality, art history, and traditional French terra cotta figurines called Santons, 'Scenes from Provence' is a handmade accordion book containing 24 color photo montages. 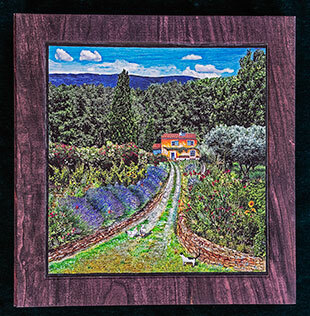 … The cover resembles an old fraying book, and the interior relates to Provence at the end of the 18th Century." Introduction: "Before the invention of trains and planes, tradespeople of southern France wound their way along dirt roads from village to village offering their wares on foot, wagon or horseback, trading news and gossip along the way. Santons are terra-cotta figurines modeled after these artisans. "Santons first appeared at the end of the eighteenth century in Nativity scenes as everyday characters from old Provence, each one portraying a different métier or role. In traditional dress and with tools of their various trades, they represent village life at that time. "This collection places Santons in imaginary contexts with real objects and details from photographs and paintings, including those of the Impressionists, who were inspired by the lavender fields and olive groves of Provence." Inspirations for Skoff's montages include Pierre Bonnard, Paul Cezanne, Claude Monet, Vincent van Gogh, and others. Another source of inspiration in the tomb sculptors of the Court of Burgundy. The montages reward close inspection. Look for Skoff behind a camera or behind an easel. The montages build on each other so there are bits that move from one to another (for example, the doll maker's scene incorporates images of the butcher, the women washing, and the violinist). Technique from the Artist: "I choose the Santons … for their expression, clothing, or role that they are portraying. I imagine a story that goes with them and create a photographic collage. This composition process has many layers and elements including my own photographs, pieces of paintings I find in museums or books, collage, and sculpture. For example, when I found my woodsmen and his wife in a flea market I took them home and first photographed them in front of an image I’d taken of a real forest. I then photographed rabbits and placed these in the 'forest' to populate it. … I re-photographed the couple in front of the photo of themselves with the added animals and birds along with a pile of twigs I had gathered and tied together with string to add to their bundles. … At times I use Photoshop to montage and integrate all the elements together into the final photograph." Berkeley, California: Gail Skoff, 2010. Edition of 7. 11 x 15"; 18 pages including pastedowns. Double-sided accordion book. Images printed on Moab Entrada Rag Natural paper by The Lightroom. Text letterpress printed by Patricia Curtan. Bound by John DeMerritt. Bookbinding paper over boards with tipped on chimney images. Housed in clamshell box with titles stamped in gilt on spine and cover. Boards and box covered in handmade paper by Cave Papers. 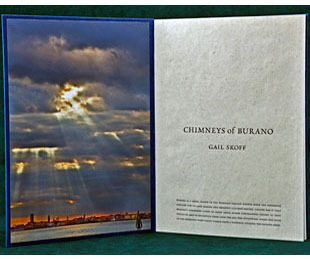 Gail Skoff: "I consider this book a circle book, because as you start reading and looking at the images you can turn it over and continue the viewing on the reverse side, and end up at the title page again. "I first visited the island of Burano in 2007. I was coming from Murano and was en route to Torcello, islands in the Venetian lagoon, where I had been photographing mosaics in ancient churches. I stepped off the vaporetto on a whim and fell in love with the vibrant colors of the village, which were unlike anything I had seen in the area. The brightly painted houses were a complete contrast to the tiny mosaic patterns I had been photographing and looked like children's building blocks in bold bright colors. I grew fascinated by the time-weathered buildings, and by the chimney's sculptural forms. They showed their colors vividly, uninterrupted by windows and doorways. "Local legend has it that Burano's fishermen chose to paint their homes contrasting colors so they would be able to recognize them from the sea." Berkeley, California: Gail Skoff, 2009. Edition of 7 + 2 Artist's Proofs. 11.75 x 11.75" closed; 13 pages. Double-sided accordion. Archival pigment printing on Moab Entrada Rag Natural paper by The Lightroom. Letterpress printing by Peter Koch. Bookbinding by Pettingell Book Bindery. Handmade cover paper by Cave Papers. Title embossed on front board. Housed in a matching paper covered clamshell box. 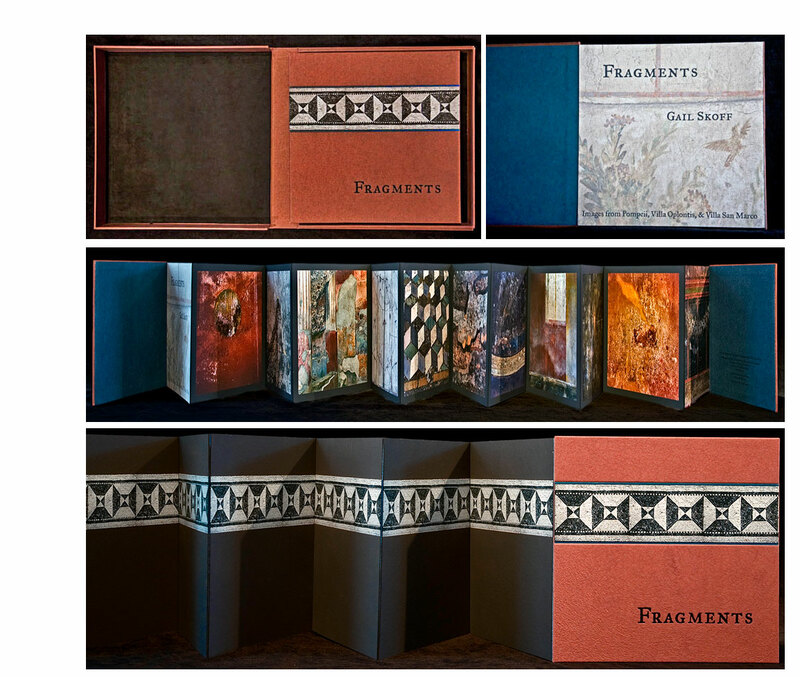 Gail Skoff: "Fragments is a handmade book presented in its own clam shell box. It contains twelve archival pigment photographs from Pompeii, Oplantis, and the Villa San Marco, which are located in the Campania region of Italy. An ancient floor frieze runs down the back of the book. "Maybe 15 years previous to making Fragments I had occasion to visit Pompeii and took many pictures. A decade later, immersed in a project photographing the colors on walls in the south of France where I live half of every year, I rediscovered these photos. That began a three-year long odyssey visiting the ruins in southern Italy, where I knew I had to go after rediscovering those snapshots. The colors in these ruins were so beautiful, some faded and others still intense. The forms, when photographed close-up appeared ancient and modern simultaneously, invoking an intense emotional response for me."